Betfred Bingo | Join & Play Betfred FREE Bingo! 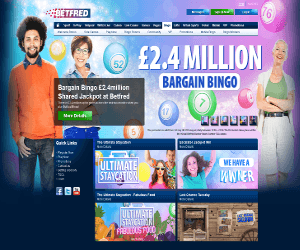 ‘You’ll love a bit of Betfred Bingo’ is the promise made as soon as a player visits the site. Betfred Bingo is operated by Betfred, the world’s largest independent bookmakers and the UK’s biggest independent high street retailer. Players feel confident playing at this trusted site which offers a wide variety of bingo games, slots, casino and live dealer games. Their themed bingo promotions also add heaps of extra fun and earning potential to your bingo sessions! All new players can claim a fabulous Betfred Bingo bonus as soon as they join. For a first deposit of just £10 you’ll get an extra £30 to play with. This generous welcome offer includes £30 for bingo and £10 for slots so you can play all the games you love with your bonus cash. What’s great about Betfred Bingo is that the sign up process is super quick and simple with just half a page of info to fill out. Once you are a funded player you can start enjoying all the fun bingo on the site. First off, every weekday you can play Penny & Tuppence Mornings in the Betfred Bunker room. Tickets cost as low as 1p with jackpots reaching up to £1,500! There is a whopping £400,000 to be won in the Big Bingo Bonanza which happens the last weekend of every month. From 12pm-12am play in four designated bingo rooms for your chance to win incredible guaranteed jackpots! There are so many more exciting offers at Betfred Bingo that you have to check out for yourself! Roll on Monday has prizes up to £10,000, XTG Wednesday gives you the chance to win a share of £11,000, and Rainbow Riches Bingo has a fabulous £10k jackpot on offer. Plus, there are more amazing promos to take advantage of at Betfred Bingo! There are 12 exciting bingo rooms to play in at Betfred Bingo. One of the more popular rooms is Bouncy Balls Bingo which has this multi-stake game playing 24 hours a day! Boogie down in the 90 ball Disco Room where you can join fellow funky players and play for as low as 1p! This room also hosts a lot of Betfred free bingo specials where you can play for free and win for real! Your favourite slot game comes alive in a bingo version with the Rainbow Riches Bingo room open 24 hours a day. This 40 ball game has loads of Irish-themed excitement and lucky prizes to be won! If you’re a fan of casino games than make sure to check out Betfred Bingo’s side games section. There are heaps of games to choose from including some of the most popular titles as well new releases. Spin to win the adorable Fluffy Favourites and spin the Roulette wheel for wig winning opportunities. Take Betfred Bingo with you wherever you go when you play on your smartphone and tablet. Play on the mobile site or download the free app for iOS and Android and never miss a win. The Betfred Bingo mobile apps make it super easy to access all the fun games and exciting promotions the site has on offer!